The Leagues of Women Voters Lake Michigan Region (LWVLMR) and Upper Mississippi River Region (LWVUMRR) join in sponsoring a day of water-related topics in conjunction with their annual meetings one day before the 2018 League of Women Voters of the US (LWVUS) convention. The LWV Upper Mississippi River Region and Lake Michigan Region InterLeague Organizations (ILO) will hold their annual meetings in Chicago on Wednesday, June 27 (11:30 am to 9 pm), followed by a workshop on Water: Advocating for Protection, capped off with an evening banquet. These events are scheduled in coordination with the national LWVUS convention, also in Chicago, which begins June 28. The regional LWVLMR and LWVUMRR meetings will take place in The Standard Club, which features original architecture from 1869. The Standard Club is located about a half mile from the Chicago Hilton, site of this year's national Convention. Protection: Put Your League on the Map! 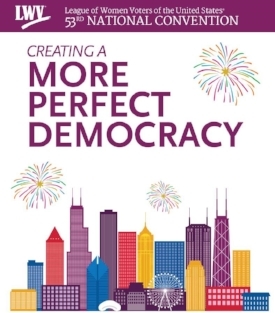 The national LWVUS Convention runs from Thursday, June 28 (12:00 pm) to Sunday, July 1 (12:00 pm) at the Chicago Hilton on Michigan Avenue. Hotel rooms are still available, but going fast. If you are interested in being a voting delegate, please notify our office, as the number of delegates is limited by the membership of the individual League and the total state membership.